We believe that Americans have a right to purchase and use firearms» for lawful purposes. The private ownership of firearms in America is traditional, bur that ownership imposes the responsibility on the gun owner to use his firearms in a way which will ensure his own safety and that of others. When firearms arc used in a safe and responsible manner, thev are a great source of pleasure and satisfaction, and represent a fundamental part of our personal liberty. Firearms do not cause accidents! Firearms accidents are almost always found to have been the result of carelessness, or ignorance on the part of the shooter of the basic rules of safe gun handling. The following rules must be observed by gun users at all times. Safe gun handling is not just desirable, it is absolutely essential to the continuation of gun ownership and sport shooting as we know it today. 1. LEARN THE MECHANICAL AND HANDLING CHARACTERISTICS OF THE FIREARM YOU ARE USING. Not all firearms arc the same. The method of carrying and handling firearms varies in accordance with the mechanical provisions for avoiding accidental discharge and the various proper procedures for loading and unloading. No person should handle any firearm without first having thoroughly familiarized himself with the particular type of firearm he is using, and with safe gun handling in general. 2. ALWAYS KEEP THE MUZZLE POINTED IN A SAFE DIRECTION. Rc sure of the bullet stop behind your target, even when dry-tiring. Never let the muzzle of a firearm point at any part of your body or at another person. This is particularly important when loading or unloading a firearm. In the event of an accidental discharge, no injury can occur as long as the muzzle is pointing in a safe direction. A safe direction means a direction which will not permit a discharged bullet to strike a person, or to strike an object from which the bullet may ric<xhet. A safe direction must take into account the fact that a bullet may penetrate a wall, ceiling, floor, window, etc., and strike a jnrrson or damage property. Make it a habit to know exactly where the muzzle of your gun is pointing whenever you handle it, and be sure that you are always in control of the direction in which the muzzle is pointing, even if you fall or Stumble. 3. FIREARMS SHOULD BE UNLOADED WHEN NOT IN USE. Firearms should be loaded only when you arc in the field or on the target range or shooting area, ready to shoot. Firearms and ammunition should be securely loeked in racks or cabinets when not in use. Ammunition should be safely stored sefxiraic from firearms. Store your firearms out of sight of visitors and children. It is the gun owners resfxynsihility to be certain that children and persons unfamiliar with firearms cannot gain access to firearms or ammunition. 4. BE SURE THE BARREL IS CLEAR OF OBSTRUCTIONS BEFORE SHOOTING. Even a bit of mud, snow or excess lubricating oil or grease in the bore may cause the barrel to bulge, or even burst on firing, and can cause injury to rhc shooter and bystanders. He sure that you are using ammunition of the proper caliber and loading for the gun you are using. If the report or recoil on firing seems weak, or doesn't seem quite right, (:KASH FIRING IMMEDIATELY and check to be sure that no obstruction has become lodged in the barrel. 5. BE SURE OF YOUR TARGET BEFORE YOU SHOOT. Don't shoot unless you know exactly where your bullet is going to strike. Be sure of the bullet stop behind your target, even when dry-firing with an unloaded gun. If you are in the field hunting, do nor fire at a movement or noise. Take the rime to be otaolureiv certain of your target before you pull the trigger. 6. WEAR SHOOTING GLASSES AND HEARING PROTECTORS WHEN YOU SHOOT, All shcx>ters should wear protective shooting glasses and some form of hearing protectors when shooting. 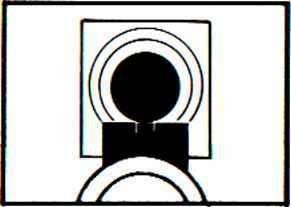 Exposure to sh<x>ting noise can damage hearing, and adequate vision protection when shooting is essential. 7. NEVER CLIMB A TREE OR FENCE WITH A LOADED FIREARM. Put the tirearm down carefully before climbing a fence, and unload it before climbing or descending a tTee or jumping over a ditch or other obstruction. Never pull or push a loaded firearm toward yourself or another person. When in doubt, unload your gun! 8. DONT SHOOT AT A HARD SURFACE, OR AT WATER. Bullets can glance off many surfaces like rocks or the surface of water and travel in unpredictable directions with considerable velocity. 9. NEVER TRANSPORT A LOADED FIREARM. Firearms should always be unloaded before being placed in a vehicle. A suitable carrying case or scabbard should be used to carry a firearm to and from the shooting area. 10. AVOID ALCOHOLIC BEVERAGES WHEN SHOOTING. Don't drink unril the day's shtxrting is over. Handling firearms while under the influence of alcohol in any form constitutes a criminal disregard for the safety of others. Top of front sight even with top of rear sight blade. Front sight centered in notch of rear sight blade. Target bullscyc centered on top of front sight.